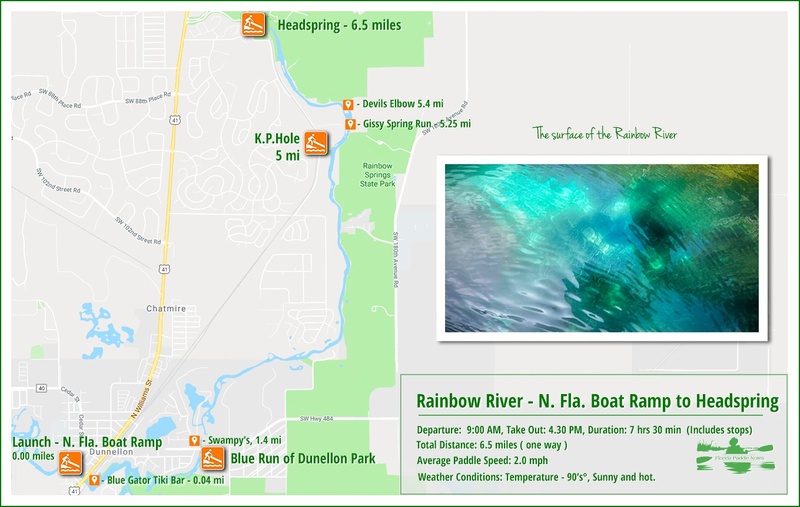 The Rainbow River, is located, in Dunellon, Fl, about 20 miles southwest of Ocala, in Marion County. 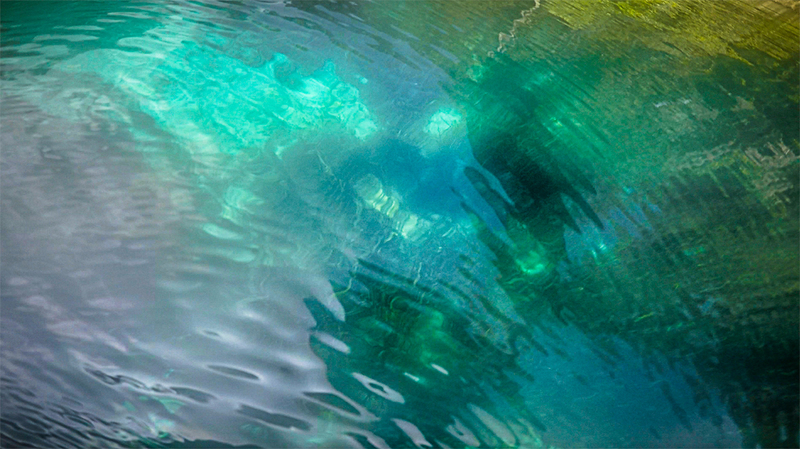 The headspring, Rainbow Spring, is a 1st magnitude spring that ranks 4th in the state for volume, discharging 400-600 million gallons of water a day! The spring is composed of numerous vents rather one single vent. There are many smaller springs along the river, discharging water from numerous caves, crevices and sand boils. 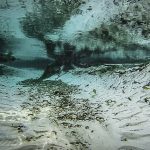 The river is 5.7 miles long, flowing into the Withlacoochee River, where it’s crystal clear water meets the dark tannin water of the Withlacoochee. 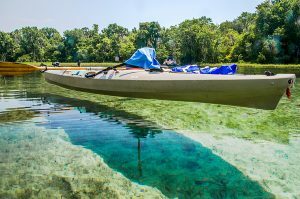 The Rainbow River had several names over the years, to include Wekiwa Creek, Blue Spring and Blue Run and in the late 1930’s was renamed The Rainbow River. 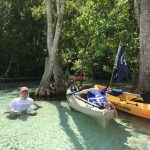 In 1972, the Rainbow River became a Registered Natural Landmark and was followed by becoming an Aquatic Preserve in 1986 and an Outstanding Florida Waterway in 1987. The river hosts an abundance of wildlife and diverse vegetation. 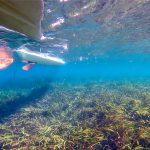 The water clarity is extraordinary! 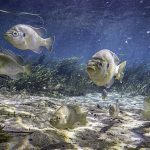 Further, interesting history on the Rainbow River can be read on Lars Anderson’s website Adventure Outpost. 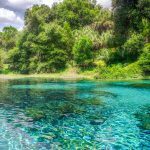 Location: The Rainbow River, is located, in Dunellon, Fl, about 20 miles southwest of Ocala, in Marion County. It flows south for half of it’s length, turning southwesterly for the final half. Blue Run of Dunnellon Park – 19500 – 19636 SW Hwy 484, Dunnellon, FL 34432. Nice launch, Restrooms, Parking fills quickly! K.P. 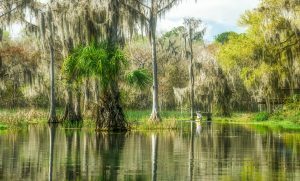 Hole County Park – 9435 SW 190th Avenue Rd, Dunnellon, FL 34432. Nice launch, Restrooms, Parking fills quickly! Daily user fee of $5.00, Rentals and tours. 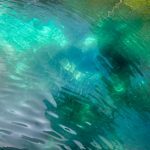 Rainbow Springs State Park – 19158 SW 81st Place Rd. Dunnellon FL 34432. Fee $2.00, Kayak launch requires a cart or wheels. 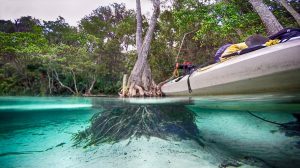 Paddle Distance: One way to Rainbow Spring is 6.5 miles against an easy current. The actual Rainbow River is 6 miles long, with a 1/2 mile on the Withlacoochee. Average Paddle Time: 2 mph. Current – Tidal: The river is spring fed and the current is a gentle 1.7 mph on average. Side Paddles: There is a side ‘paddle’ if you want to venture up into Gissy Spring Run, also known as Indian Creek. 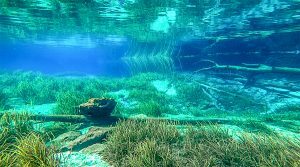 It is very shallow and has several trees over it requiring us to leave the kayaks and walk along the sandy bottom. The property was posted at some point as well as having a gate so we decided to turn back. It was pretty though. Rest Areas: There are restroom facilities at the head spring, K.P. Hole, Blue Run Park and several areas along the river where it is shallow enough to exit your kayak. 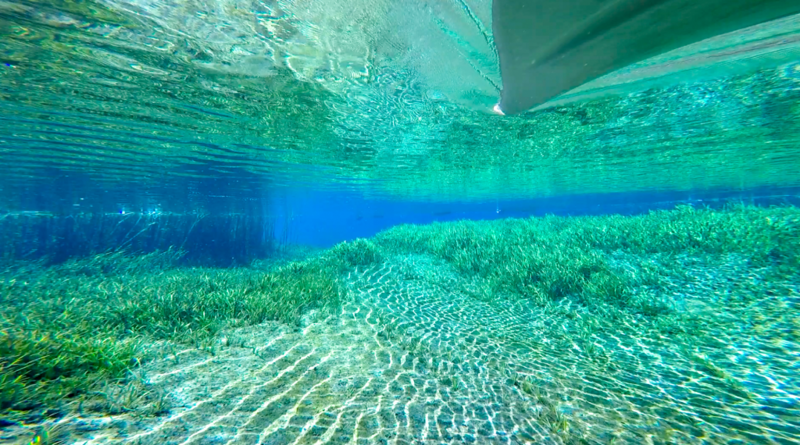 We always enjoy tying up at the entrance to Gissy Springs Run and enjoy the clear water and white sandy bottom 29° 5’25.15″N, 82°25’33.23″W. It was an exciting day today as it was my first trip on the Rainbow River! I have been kayaking for 11 months and now it was time to visit a river I have heard so much about. We decided to launch at the North Florida Ave Boat Ramp, located in Dunnellon, Fl. 29° 2’46.12″N, 82°27’53.04″W. Our reason for starting at the end was to finish the round trip here, walk across the street to one of our favorites spots in this area, The Blue Gator Tiki Bar & Restaurant. Cold beer and Gator Tail would be our reward for the long paddle. The Withlacoochee River had a medium flow as we launched the kayaks and headed south, against the flow toward the Rainbow River. The water was the typical ‘Tannin Tea’ color of many of our rivers and we anticipated seeing the clear water of the Rainbow River. Paddling for about a half an hour, we arrived at the confluence of the two rivers. At the time it wasn’t too well marked but the color of the water was definitely changing and we continued on, under a sunny sky, temperature in the 80’s. It was very noticeable that the eastern side of the river was densely wooded while the western side was populated. Between the Rainbow River State Park and the Cross Florida Greenway, there was little left to be populated along that eastern shoreline. We continued on a more northerly direction now, still paddling against the current, though it wasn’t too strong. At 1.4 miles we reached the 484 bridge and as we passed under saw Swampy’s Bar & Grille on our left, made a note to remember to visit in the future. Also Blue Run of Dunnellon Park is on the eastern side of the river, a nice launch area for future paddles. 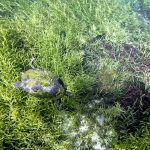 By this time, the water continued getting clearer, with beautiful sections revealing white sandy bottoms, some areas with lime rocks and the ever flowing eelgrass. 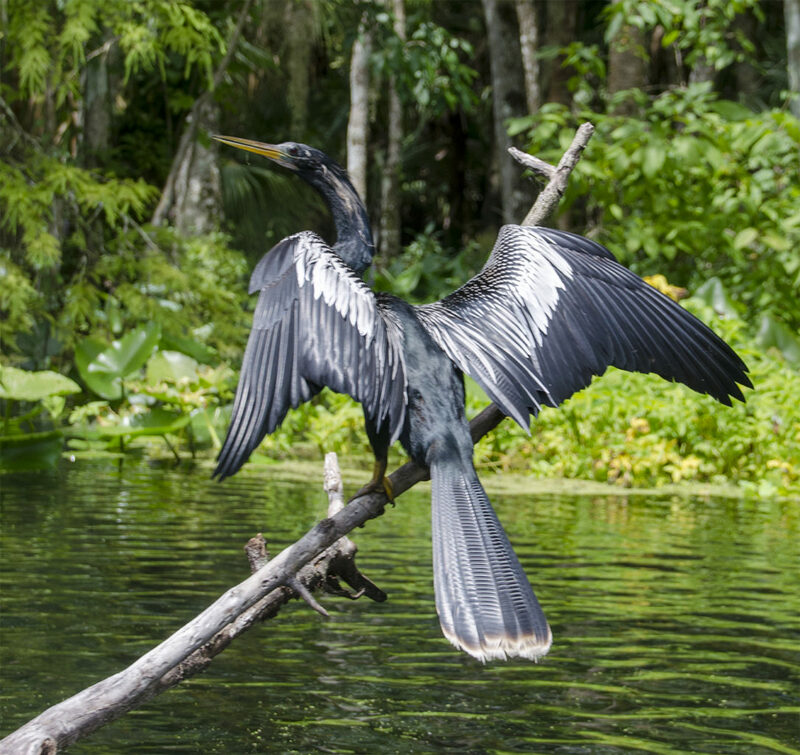 Anhingas were quite prevalent as we paddled, as were numerous turtles. It was apparent we were getting closer to K.P. Hole as, by now, the river was being inundated with numerous tubers on the way down to the take out we had just passed. Being a hot Saturday in July, it was expected to be crowded. All around us was a myriad of tubes and floats, kayaks and boats! At first we were the only ones paddling ‘upstream’ against the current, but now, once at K.P.Hole, folks were going in both directions, paddling up to the main spring and others leisurely floating downstream. We took a rest stop at K.P.Hole before continuing on. It was at 5 miles when we reached K.P. Hole County Park. It was the section from here North to the main spring that truly amazed me. I have never been on such clean, clear water in my life. Absolutely beautiful! When the ripples of the surface reflect the light from above it is definitely reminisce of a rainbow. 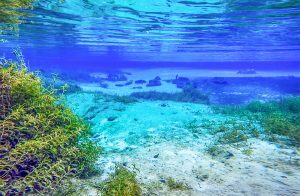 Yellows, reds, aquas and blues appeared and dazzled.There were many more areas of beautiful white sand bottoms, rocks and clear water reflecting aqua and green. The water was so clear, that our kayak appeared to float in mid air! About a half mile up from K.P.Hole, we rested where Gissy Spring Run enters the river. 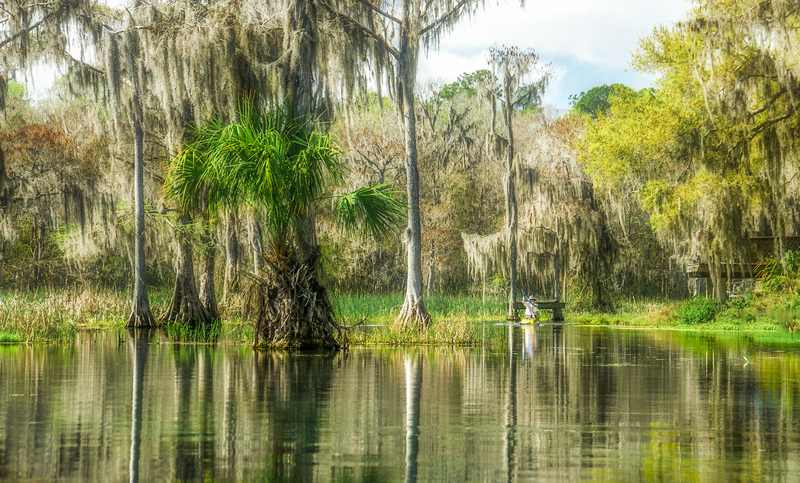 Here, a couple of Bald Cypress offer a tie up in the 18″ of water with a white sand bottom. It was paradise for sure! We then ventured, with the kayaks, up into the run hoping to get to the spring, but reached a gate several hundred feet into the run as well as no trespassing signs. We retreated back to the river, continuing our trip to the head spring. Just up from Gissy Spring Run we paddled over the deepest part of the river, caves known as Devil’s Elbow and/or Garfish Hole. 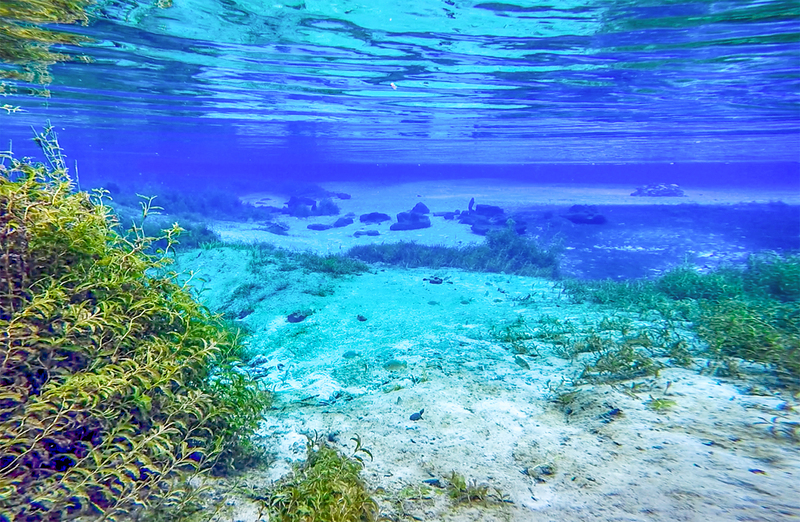 A great spot for divers as the water here is 20 – 26 feet deep. The last stretch of the way offered more turtles than any other areas. They can be seen on logs as well as swimming below the surface. 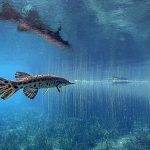 I used my GoPro to photograph numerous underwater scenes, some posted in this article. The head spring, Rainbow Spring, is roped off and boats are not permitted in the spring area, however we were able to get in the water and swim over to the spring…and it was beautiful. We enjoyed a short stay at the spring, cooled off, and headed back, ,6.5 miles to the launch. It was a hot day, but we stayed cool and despite paddling back with the current, decided 12 miles was a bit much on that day. 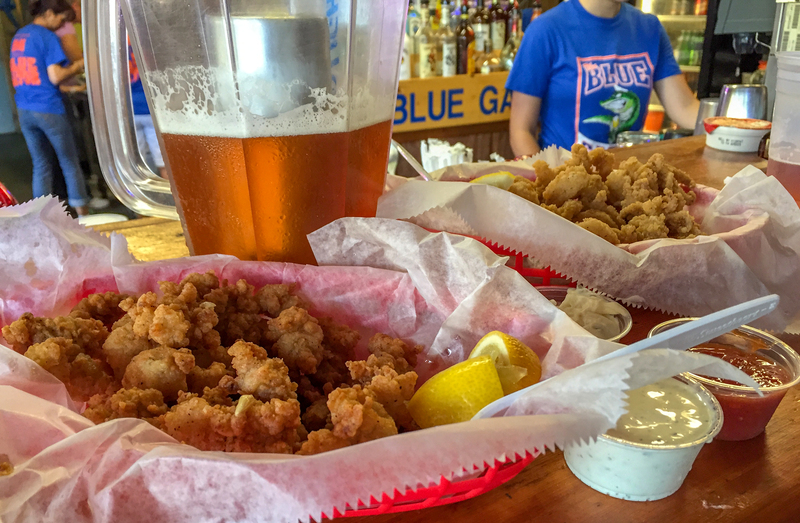 We enjoyed Gator, Calamari and cold Stumpknocker beer, ending another chapter of Florida Paddle Notes. Parking for all launches fill very quickly, often by 10:00am so an early start is wise. Disposable containers (such as cans, plastics, glass, plastic foam or paper) are not permitted on the River. No Alcohol on the river. The main springs are protected. Motorized vessels, anchoring, diving and fishing are not permitted beyond the marker buoy.